This summer England will make the short trip to France to compete in Euro 2016. But when the French last hosted the European Championship in 1984, England failed to make it. Today we look back at what went wrong, as Bobby Robson’s reign began in difficult fashion. Bobby Robson’s appointment as England manager was confirmed shortly after Ron Greenwood’s men were eliminated from the 1982 World Cup in Spain. His reign at Ipswich Town had earned many plaudits and yielded two major trophies, with the proud Englishman now tasked with leading his country. He would have little time to dwell on the task in front of him, as his first match in September 1982 was the opening European Championship qualifier away to Denmark. 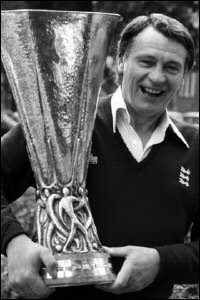 Bobby Robson took over as England manager a year after leading Ipswich Town to UEFA Cup glory. On paper, England had been handed a reasonable qualifying draw, with their opponents being Hungary, Greece, Denmark and Luxembourg. Hungary had finished above England in qualifying for the 1982 World Cup but England had done the double over them and progressed further at the finals; Greece had qualified for the 1980 European Championship but had little other pedigree; and Luxembourg were the whipping boys of Europe. The joker in the pack came from pot four. Denmark had enjoyed limited past success but something was stirring in Scandinavia. Manager Sepp Piontek was building a side that would soon be talked about across Europe, but – despite beating Italy in World Cup qualifying in 1981 – had yet to come into the spotlight. Robson though knew just how talented they were and he probably cursed whoever had agreed for England to start with a trip to Copenhagen – particularly as the average man in the street would assume England were going to win there. Robson had difficult decisions to make prior to the Denmark game, having inherited an ageing side. Robson was primarily setting his sights on success at the 1986 World Cup and he knew time would have to be called on the international careers of several players. As we’ve previously recalled, Robson controversially dropped Kevin Keegan and came under fire before he’d even led his team into battle for the first time as the former captain took exception to not being told the news directly. A decision that probably was harder for Robson to make on a personal level was to leave out his former Ipswich captain Mick Mills, while other old heads including Trevor Brooking, Joe Corrigan, Terry McDermott and Dave Watson would never win another cap. Ray Clemence would be selected just twice more as Peter Shilton became fully established as number one goalkeeper. Robson’s first year or so in charge would see a high number of debutants given their chance. Players such as Luther Blissett, Mark Chamberlain, Gordon Cowans and Sammy Lee would briefly shine before fading from the international scene. Only John Barnes would break into the set-up during the period and remain involved throughout Robson’s reign. Robson’s cause was not helped by injury woes for key men he inherited, with his favoured midfielders of Glenn Hoddle, Bryan Robson and Ray Wilkins all spending time on the sidelines during the qualifying campaign. To compound matters, winger Steve Coppell would sadly soon have to retire due to his injury troubles. England’s Bryan Robson in action against his future Manchester United team-mate in England’s opening Euro ’84 qualifier against Denmark. If Bobby Robson was under any illusions about the size of the task facing him, then the first match in Denmark would have shattered them. Firstly, the fallout with Keegan meant he had attracted negative publicity in his opening weeks in the job. Secondly, England were shaken by the Danes who duly looked the real threat Robson had feared. And thirdly, there was widespread fighting on the terraces. It was the third year in a row that an England match overseas had been blighted by serious crowd trouble and Robson was left knowing that his time in charge would see him regularly being asked about a section of England’s followers and not matters on the field. England came within moments of snatching a 2-1 win thanks to two Trevor Francis goals in Copenhagen before Jesper Olsen waltzed through to equalise, but it was felt afterwards that England were the team who had been let off the hook during the 2-2 draw. The Danes were certainly no longer the low-achieving amateurs of a few years before. ‘England are lucky to escape defeat’ screamed the headline in The Times, with the new manager admitting it would have been a “travesty of justice” had they won. 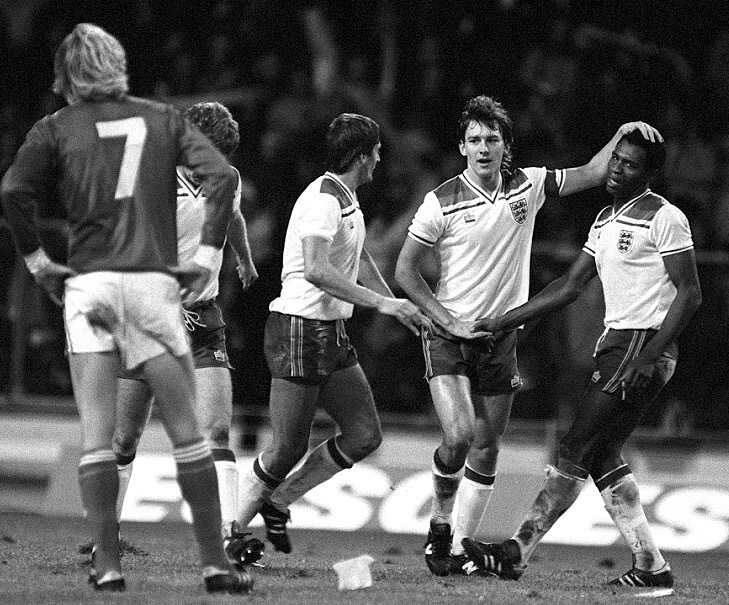 England players had nine goals to celebrate against Luxembourg in December 1982, including a hat-trick for Luther Blissett. Robson’s first home match in charge produced a 2-1 friendly defeat to West Germany, but a month later came the second European Championship qualifier away to Greece. Bryan Robson captained England for the first time and he would never relinquish it whenever he played under his namesake. Tony Woodcock scored twice and debutant Lee got the other in an excellent 3-0 win. Just 10 days before Christmas England welcomed Luxembourg to Wembley and Watford forward Blissett marked his first cap with a hat-trick in an emphatic 9-0 victory – he never scored again for his country – that meant they boasted a goal difference of +12 after only three qualifying matches. England began 1983 with a 2-1 win over Wales in the Home International Championship, before welcoming Greece to Wembley in March for their next qualifying match. It proved an extremely frustrating night for England as the Greeks did not come bearing gifts and defended deeply. England were unable to break the visitors down and were booed off after a 0-0 draw. “I counted seven of Greece’s players who never even crossed the halfway line,” said Robson as he reflected on a frustrating night. The night had marked the first real low point of Robson’s reign but all looked good again when England won 2-0 at home to Hungary the following month, Francis and Peter Withe scoring. After five matches in the group England had three wins and two draws and were still firmly in the qualifying picture. “Within a month the tune has changed dramatically for Bobby Robson,” wrote Stuart Jones in The Times. The Home International Championship was won after drawing 0-0 away to Northern Ireland and winning 2-0 against Scotland. The latter match took place on the same day as a vital qualifying clash between Denmark and Hungary. The Danes won 3-1 and it was now clear they would provide the most serious threat to England’s qualification hopes. England ended the 1982-83 season with a three-match tour of Australia, which brought a plethora of new caps and an unbeaten record but precious little else to shout about. Robson and his under-strength side returned home with a three-month break in store before their next match – a huge qualifier at home to Denmark in September 1983. The Danes arrived at Wembley with the backing of a tremendous away support. With only one side going through to the finals, this match was likely to be decisive. England led the group by a point but Denmark had a game in hand. Whoever won would be clear favourites to progress. If the match was a draw then matters would be in Denmark’s hands but with little margin for error. England were without the injured Bryan Robson and, controversially, Hoddle, with Bobby Robson opting instead to field John Gregory. “I wanted someone a bit spikey,” said the manager as he tried to justify his selection. But it proved a bad call, England’s midfield operating deep and creating little for the forwards to feed off. From the moment teenager Michael Laudrup almost gave Denmark an early lead, it was clear that this was going to be a long and torturous night for England. Bobby Robson seemed to have become too concerned about the threat of the Danes for his own side’s good, as England played with fear rather than belief. Phil Neal’s handball in the area on his 50th and final cap allowed Allan Simonsen to put the Danes in front in the first half and they continued to boss the game, albeit without creating many clear-cut chances. “We are red, we are white, we are Danish dynamite” was the song ringing out at Wembley. 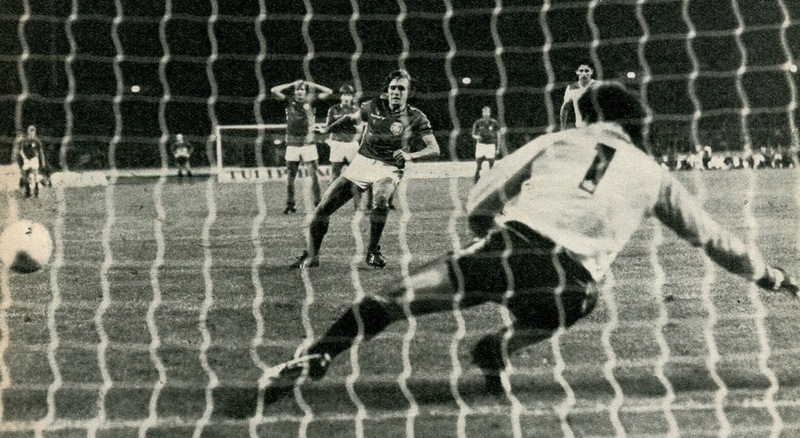 Allan Simonsen scores the winner for Denmark against England from the penalty spot. They deservedly protected their 1-0 advantage, with England posing little threat until injury time. Suddenly a chance was made by Blissett, but he was denied by Ole Kjær from point blank range just seconds before the final whistle sounded. Prior to the emergence of Peter Schmeichel it was generally felt that goalkeeper was the weak position for the Danes, but Kjær had proved his worth with such a priceless save. It was the first time the Danes had ever beaten England and the win left them firm favourites to reach France. Three days later Robson was booed when he went to watch Aston Villa against Southampton, while Hoddle scored a superb goal for Tottenham Hotspur at Watford. The decision to leave him out of the Denmark game looked to have been the wrong one. Matters were now well and truly out of England’s hands. They would have to win away to Hungary and Luxembourg and hope Denmark took no more than three points from as many games (under two points for a win) – with it being a given they would beat Luxembourg at home in one of them. They duly did so by a 6-0 scoreline on October 12, the same day England visited Hungary. Hoddle was recalled to the side and he responded with a superb free-kick in the 3-0 win, which gave England a glimmer of hope. But so comfortably had they beaten the Hungarians that it was hard to see the Eastern Europeans doing England a favour by getting a result against Denmark two weeks later. But that was just what they did, Denmark suffering their first defeat of the qualifying series as they went down 1-0. England had been bailed out during qualifying for the 1982 World Cup when all seemed lost and now it looked like history might repeat itself. Denmark were a point ahead of England but had an inferior goal difference. If Denmark failed to win away to Greece in their final match then England would go through by beating Luxembourg on the same night. The pressure was on the Danes. The matches did not kick-off simultaneously, Denmark decisive contest in Athens finishing before England’s contest in Luxembourg began. According to Bobby Robson, as England’s squad arrived at the stadium “some wally of a fan shouted out to us that Greece were ahead”. Within moments they learned the crushing news that the Danes were actually winning, going on to claim a 2-0 victory to deservedly win the match and the group. “It’s rather like asking soldiers to go on firing bullets after a peace treaty had been signed,” said Robson, as he was left trying to motivate his players for a dead rubber match. He duly did that as England produced a professional performance in beating Luxembourg 4-0, leaving them with the best goal difference of any side in Euro ’84 qualifying with +20. Denmark were the side celebrating at the end of qualifying for Euro ’84. But all anyone was talking about was the fact England hadn’t made it, along with yet more trouble involving the hooligan fringe. The hosts had been concerned about England’s visit after previous trouble in 1977 and unfortunately the antics of some individuals in both the stadium and on the streets had justified those fears. “They had disgusted us all by giving those lovely people a bad time for our second successive visit,” said a despairing Robson. It was not a time when the English nation was covering itself in glory when it came to football, with the hooligans continually causing trouble off the field and the players struggling to hit the heights on it. Whereas Euro 2016 in France will contain four sides from the British Isles, the finals of Euro ’84 went ahead without any of them. TV viewers in Britain saw just two live matches from one of the most highly-regarded tournaments of all-time, with the Danes playing with a swagger as they reached the semi-finals before losing on penalties to Spain. France won it on home soil and it was a competition that we missed far more than the rest of Europe missed us. That really was an incredible Danish side. How much would a teenage Laudrup be worth these days? England’s women gained a measure of revenge by beating the Danes the following April in the semi-final of their own Euro 84. Defending a 2-1 lead from the home leg at Gresty Road, Debbie Bampton headed in Pat Chapman’s corner to seal a 3-1 aggregate win in Hjørring.